Our product range includes a wide range of electric chafing dish, chafing dish, chafing dish machine, roll top chafing dish, brass chafing dish and soup chafing dish. The Electric Chafing Dish comes with inbuilt induction element so there is no need to gel to be ignited on and off. You just have to plug in for the food to get warm. It also comes with an in built temperature control system. Compared to imported variants they are low in cost. 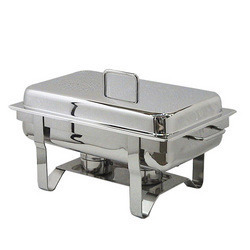 The electric chafing dish is made up of good quality stainless steel. They can also be used for the indoor purposes. These are being used in different occasions and arrangements to keep the food hot and hygienic. 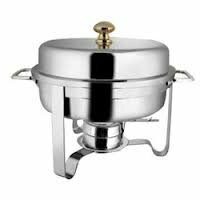 We are involved in the manufacturing a wide range of the Chafing Dish. These are manufactured by using high quality of stainless steel. These stainless steel chafing dishes are ideal for large scale events like parties dinner, wedding meals or the meals organized for the conferences or seminars. These are high voluminous and can hold larger quantities of the food. These are ideal to store food and keep the same warm for an extended period of time. These chafing dishes are being obtained in different shapes in accordance to the storage of the food. Our firm is one of the well known and reputed vendors of the industry, engaged in supplying, trading and wholesaling optimum quality Chafing Dish Machine. These attractive and eminently designed dishes are best suitable for the parties and other functions. We supply these dishes in several hotels, restaurants and other places. In safe packaging, these dishes are offered in varied range and at most affordable rates. 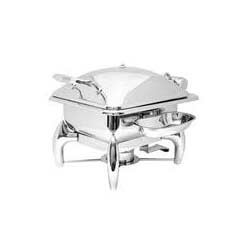 We are engaged in offering a wide range of chafing dish for Roll Top Chafing Dish. 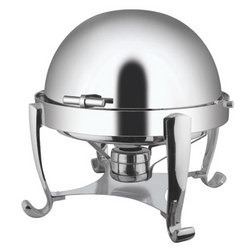 These round roll top chafing dishes are designed in compliance with a good international quality norms and standards. The offered roll top chafing dishes are being highly admired in the market due to its durability and light weight. 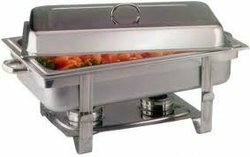 These roll top chafing dish are available in stainless steel, brass and copper by leading manufactures. Roll top chafing is used in different occasions and arrangements to keep the food hot and hygienic. These are ideal to store food and keep the same warm for an extended period of time. The dish is equipped with the top that rolls. 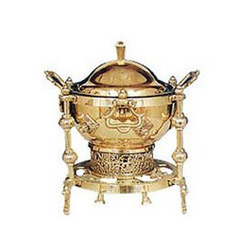 We offer a large range of Brass Chafing Dish that are available in bright mirror finishes which are provided to the clients in an array of choices provided by them. These are crafted using various materials such as Brass, Copper and stainless steel metal. 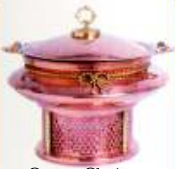 We offer our chafing dishes in customized form to suit to the requirement of the buyers. These are being used For dinning purpose in restaurants, hotels, caterers, banquet halls parties and functions other eating outlet. 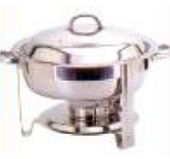 We provide a wide range of chafing dish for Soup Chafing Dish. These are generally used for keeping the soup warm for an extended period of time. These generally comprises of its material made up of good quality stainless steel. 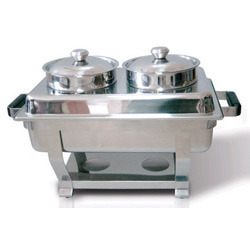 Soup chafing dish is used in the occasions, in the restaurants, hotels and other parties. These are high voluminous and can hold larger quantities of the soup. These are generally very versatile and are durable. They can be of various sizes or shape in accordance to the quantity of the soup. 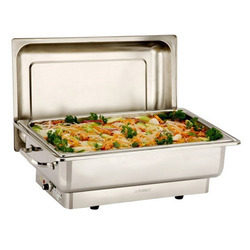 With state-of-the-arty infrastructure facilities, we are offering a wide range of Hydraulic Chafing Dish. These elegantly crafted dishes are offered after stern checking and testing that are conducted by our quality checkers. They test them on well defined quality parameters to ensure their reliability and faultlessness. Moreover, we offer these dishes in varied patterns and at nominal prices. Looking for Chafing Dishes ?